by Darrell Boone | photos by Greg LatzaBy creatively partnering with area businesses to turn waste products into energy sources, POET’s Biorefinery at Chancellor, South Dakota has developed one of the smallest carbon footprints in the ethanol industry. 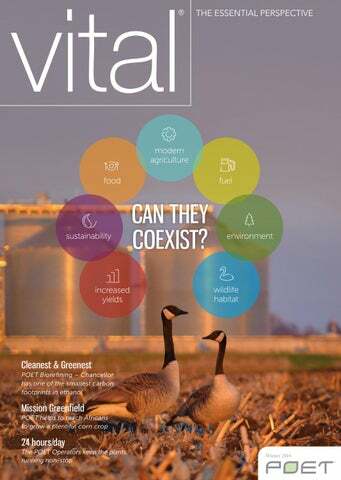 by BryAnn Becker KnechtOver the next several issues, Vital is giving you a chance to meet the team at POET. They are the heroes of POET and the ethanol industry. Their day job – and for some, over-night job – includes producing ethanol. But it’s more than that. It’s a passion for this American fuel and the ag communities they reside in. It’s a better future for their kids and grandkids. by Lori Weaver | photo by Greg LatzaModern agriculture, increased productivity, wildlife habitats and sustainability can coexist. Perspective: What are you doing to increase production while protecting the environment/habitat?